In December 1996, I moved to San Francisco. That Christmas and New Year, my friend Nick came to visit, and we decided that to fit in with the locals, I'd have to do all of the things the locals do. So we went out mountain biking, tasted the local wine, visited the microbreweries, went to the beach, and hired roller blades on a quiet afternoon. I had ice skated a little bit, but never used roller blades before. I quickly found it to be harder than I expected, there was a lot less resistance from the blades. Very soon after we started, I found myself on a shallow slope, got out of control, and fell over while desperately trying to keep my balance. As I fell my right lower leg twisted outwards, I heard a loud popping sound, and I ended up on the ground. There wasn't much pain and I was able to stand up shortly, so I didn't think I had done anything serious. In fact I continued to skate for a short while afterwards. Over the next day my knee swelled up a little bit and was painful. I wasn't able to go cycling again during that vacation. I used a support bandage for a couple of weeks, but when it became obvious that I wasn't getting any better, I consulted my medical insurance and then went to see the Orthopaedics clinic at Stanford University, close to where I work in Menlo Park. 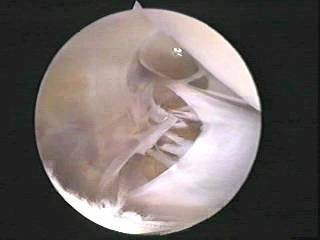 The initial diagnosis took some time, probably because I was being very protective of the knee and unconsciously tensing the muscles around the joint when the doctor manipulated my knee; the muscles had not been damaged, so tensing them masked the looseness of the joint. An MRI scan settled the matter, it was clear that the anterior cruciate ligament (ACL) had been completely separated. This ligament is internal to the knee joint, and prevents excess motion of the joint surfaces forwards and backwards. This was also bad news because I had been intending to learn to ski properly that winter, and the ACL is very important in stabilising the knee joint for the sort of turning motions experienced during skiing. I didn't want to rush into anything immediately, so after the diagnosis I gathered as much information as I could about ACL injuries. The doctor told me that there would not be much damage caused by the lack of an ACL for a while (in fact some people elect not to have any operation, and get by fine for the rest of their lives without an ACL). This allowed me to delay the decision on whether to get an operation, and see how much functionality I could restore. I attended the Stanford Sports Injuries and Rehabilitation clinic for several weeks, working on exercises to strengthen the muscles around the joint and increase its flexibility. By the summer, I was mountain biking and swimming again, but I had a constant low-level pain in my knee during hard exertion. I also found out as much as I could about the surgery available. The doctors explained the types of operation available, the operation procedures, success rates, and what the operations were expected to achieve. The ACL reconstruction operation is a functional restoration operation, if successful it allows a complete or near-complete return to pre-injury functionality of the joint. There was some speculation amongst the doctors that it may help prevent premature arthritis in the joint, but there had been no long-term studies to prove or disprove this. During this period I also found out that ACL injuries were very much more common than I'd thought; when I mentioned it, I found that many people I met had had knee surgery. During the summer I made the decision that I wanted to have the ACL restoration by an allograft (tissue taken from a cadaver). The alternative operation would be to take a part of one of my other ligaments and use it, but I decided against that because I did not want to potentially impair my functionality in other ways. I felt that if the allograft did not take, I would not be in any worse condition than before, and if it did work I would potentially be much better. I must admit that I gave the speculation about premature arthritis too much weight, even though it is unproven. Once I had decided that I would have the operation, I started preparing myself for it. I knew that there would be a lot of rehabilitation exercises, and that a lot of them would hurt. I wanted to be highly motivated to do my exercises; I decided that it would be easier if I was fitter and in a regular exercise schedule. At that time, I was also a little bit overweight, at over 77kg (170 lbs). I kept a normal calorie intake, but changed my diet to cut out a lot of fat (I don't have a sweet tooth, so I didn't need to do much on reducing sugars). I started weight training (concentrating on exercises which would also be beneficial to my archery, and I increased the regularity with which I commuted by bicycle and Caltrain, even until I was enjoying cycling in the rain. I started swimming regularily. By the time of my operation, I had lost about 9kg (20lbs), and was much fitter and motivated to exercise than before. I finally had the ACL reconstruction on 22nd January 1998. The operation was delayed a couple of times because of scheduling problems with the surgeon and the Christmas/New Year holiday periods. During the delay I was beginning to reconsider whether I really needed the operation; I was fit, exercising, and worried about could go wrong. Talking to the doctors did not help, they reiterated all of the information they had provided earlier, but provided no help in making a judgement. I finally decided to go through with it after a late-night phone conversation with Nick the night before the operation. I had the first operation of the morning; I was in the hospital at 7am, into the operating theatre at 9am, out by about 11am, and a friend drove me home by lunchtime. The operation was done arthroscopically. 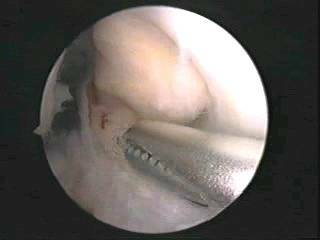 Several small incisions were used to insert a video camera lens into the joint, and other small incisions were used to insert tools and the replacement ligament. The operation was video taped, some stills from the video are shown here. In general, the video is rather boring. It is not easy to follow without knowledge of exactly what is going on during the operation. The operation was done under general anaesthetic; I had the option of general or epidural, I decided that I didn't want to be aware of anything, since the surgeons would be sawing and drilling into bone. 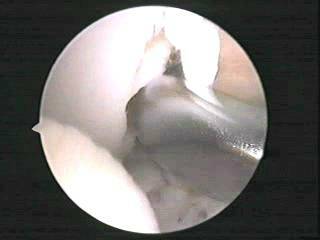 The first part of the arthroscope video shows a lot of examination and probing of the joint. The space where my torn ACL used to be is visible in these sections. The ACL was completely torn, and in the time between the injury and the operation the remains of it had all but disappeared. 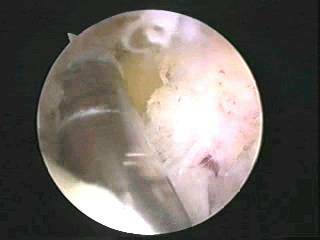 After all of the probing, the joint capsule was cleaned and some damaged cartlidge trimmed. Various implements were used for this, including a rotary cutter. The implements in these pictures look huge, but actually are very small. The lens on the arthroscope camera enlarges the apparent size significantly. Attaching a new ligament to replace the ACL is not quite straightforward. The ligament can't just be sewn into place (stitches would not hold in the ligament, and since the ligament attaches to bone it would also be impossible to sew if the previous ligament is completely gone). The ACL reconstruction operation involves cutting bone out either end of the ligament site. The replacement ligament is cut with bone each end, and the bone each end is screwed into the prepared sites. The bone eventually assimilates to provide the strength of the graft. This stage was cutting away the bone at the sites where the replacement ligament would be attached. The site for the ligament is prepared, and the replacement ligament is drawn into place by a guide-wire through the joint. The bone is drilled, and a small hex-head screw is used to attach the graft. The hex-head screw looks huge in the pictures here, but is actually only a couple of millimetres diameter. The other end of the graft was attached with a couple of metal staples. The replacement ligament was now in place. Finally all the instruments were removed, including the arthroscope camera (giving an impression of ``Fantastic Voyage'' as it came out of the guide-tube, with a glimpse of the operating theatre at the end). The first few days after the operation I count amongst the worst of my life. The painkillers I had been prescribed were not sufficient to completely numb the pain, and they had unpleasant side-effects on my metabolism. I stopped using them after a few days and just suffered the pain. One of the worst problems was having to keep the knee elevated above head-height for the first few days; this pretty much meant I had to lie flat on my back, a position from which it is difficult to read, operate a computer, or do just about anything else. I was greatly relieved when I could sit up, but the extra pressure in the joint from standing up and moving about was excruciating. I was very grateful to have a friend come in and make my dinner, do my laundry and my shopping several times, and even more grateful that one of my neighbours opened the apartment door for her; I live on the top floor of an apartment block, and the apartment door does not have a remote release on it. The rehabilitation process was painful at times, tedious at other times. There were some moments when it seemed like having the operation was a big mistake. My rehabilitation was at Stanford Rehabilitation Clinic again. The first time I visited was very difficult. I tried to used public transport to get to the clinic from San Francisco, and found it to be very awkward moving around. After that, I cajoled and prevailed upon colleagues and friends to take me to and from the clinic. Patients having ACL reconstructions used to be put into in a full-length cast for six weeks or so, and then on crutches and braces for months afterwards. The current experience indicates that getting the leg moving and active as soon as possible after the operation is beneficial, so at my first appointment the physiotherapists started manipulating the leg. There was quite a bit of swelling from the operation, and the muscles around the knee joint were not responding. I had a post-operative knee brace with a range of motion lock; initially the brace was kept locked in full extension, with the range of motion slowly increased over several weeks. I found sleeping very difficult with my leg locked straight out; I normally sleep lying straight anyway, but it's rather different trying to sleep with a brace preventing the leg from being bent at all and the leg elevated. Some times during recovery I twitched in my sleep, involuntarily contracting the muscles around the knee. This would result in me waking up instantly in pain; it was not a pleasant experience. The first few physiotherapy sessions concentrated on activating the quadriceps. This muscle is used to extend the lower leg. Initially I could not even tense that muscle. When the physiotherapist asked me to try, I felt that every other muscle in my body was tense, but I just couldn't activate the quads. By using electrical stimulation and bio-feedback devices, we quickly reached the point where I could activate the muscle and then do exercises to strengthen it. I was amazed at how quickly muscles will atrophy if not used. The preparation I had put in before the operation helped, I was diligent in doing all of my exercise sets, and keen to get back fit and riding my bicycle. Even with several daily exercise sets, it was a couple of weeks before I could lift my leg on its own without assistance from my hands. I remember that moment as a major achievement; it may sound patronising, but the experience of not being able to move my leg at will gave me a lot of respect for what disabled people endure. Another good moment early in the recovery was when I managed to rotate my feet all the way round in my bike pedals. I had bought a bike trainer to help with my recovery, and was using it for range of motion exercises on it, rocking the pedals backwards and forwards. Later in my recovery I used it for hamstring and quad strengthening, doing both single-leg cycling, endurance exercises and interval training until I felt confident enough to take the bike back on the road. I was able to dispose of my crutches a few weeks after the operation, and walk with great care using only my knee-brace. My parents visited me from the middle to end of February, and by the end of that time I was just able to drive again. While my parents were visiting I also found another use for a knee-brace; we got seated early in a restaurant we visited because the staff did not want me standing around in pain. I've resisted the temptation to put the knee-brace on just to get priority seating since I stopped needing it. I had arranged to work from home during this period, which I was very glad of, since it was also the period when the worst of the El Niño storms were starting to hit California. The knee-brace came off after another few weeks, when I was able to walk without risk of re-injuring myself through weakness in the knee. There then followed one of the more tedious parts of the rehabilitation, doing more and more of the same exercises to build strength, and extend the range of motion. I spent a lot of time working on quad strength, without realising how much my hamstring strength had also been affected. It was a bit dispiriting to find out how much work I had to do on that too. The exercises in the first weeks ranged through quad tightening, terminal knee extensions, calf stretches to leg lifts, wall squats, leg shuttles and stationary bike work. I found that getting the physiotherapist to show me a range of exercises which I could choose some different ones from helped prevent me from getting too bored with the same sets. Once I was able to ride my bicycle on the road again, the quad strength became less of a problem. Initially I experienced some pain in the knee and had to be very careful about high-stress cycling, such as riding out of the saddle, and avoided stationary holds or other tricks. Cycling is a good low-impact activity for rehabilitation. The final phase of the recovery was the closed-chain exercises, which are designed to provide feedback through the leg to the knee. These exercises were the turning and cutting motions that are stressful to the knee. I didn't think I had any problems with them until I tried to go running one day. I've never been much of a runner, so this was also an experiment to see whether I could avoid getting bored (which was always the problem I had with running before). In the first few steps, I found out how little impact my knee could really tolerate. When I got back from my run, I was surprised to find that while my right quad was fine, my left one ached! Fortunately, my tolerance for impact has increased a lot, and I now sometimes run as part of my exercise programme. I also took my bike off-road again around this time, to make sure that I could manage some more technical riding, and reinstated my medical certificate for my pilot's license. 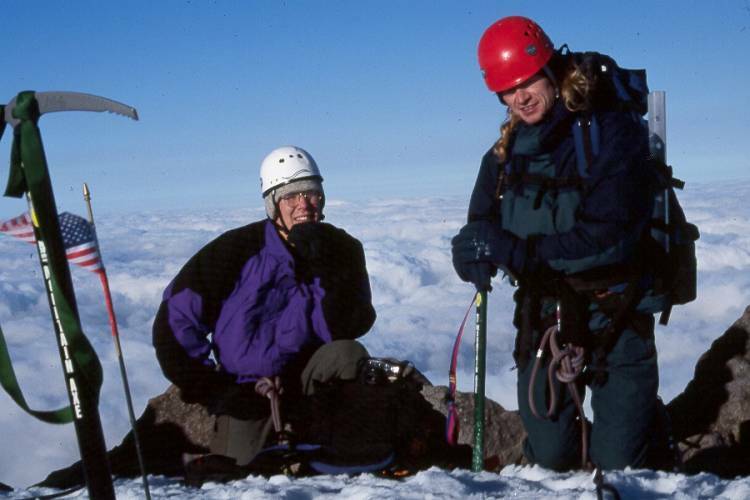 In July 1998, I proved to myself that my knee was sound again by backpacking into the wilderness with Nick and Jeff and climbing Glacier Peak, a 10,500 foot volcano in Washington State's Cascade range. I did get some swelling after our final day, which involved 30 miles of walking and about 3 miles of elevation change, including a good bit of ice climbing on the glaciers. On 10th August 1998, I had my final doctor's appointment, and was signed off to go and do whatever exercise I want, with a knee brace recommended for high impact activity. My plans now are to learn to rollerblade and ski! This time, I'm going to learn to rollerblade properly. I'll use a knee brace, stay off slopes until I can skate and stop on the flat, and learn to breakfall properly. The irony is that I had full protective gear on when I fell. If I'd accepted that I was going to fall and had controlled the fall instead of trying to stay upright, I probably wouldn't have hurt myself at all. I can't finish without thanking Bob, Laura, Danni, and the others at Stanford Rehabilitation Clinic. My recovery is now almost complete; there are some motions that cause me pain (breast stroke kick, for example), but overall I now have less trouble than before the operation, and am optimistic about a total restoration of functionality. I'm planning on getting back into karate, which I haven't been able to practice properly since the injury. 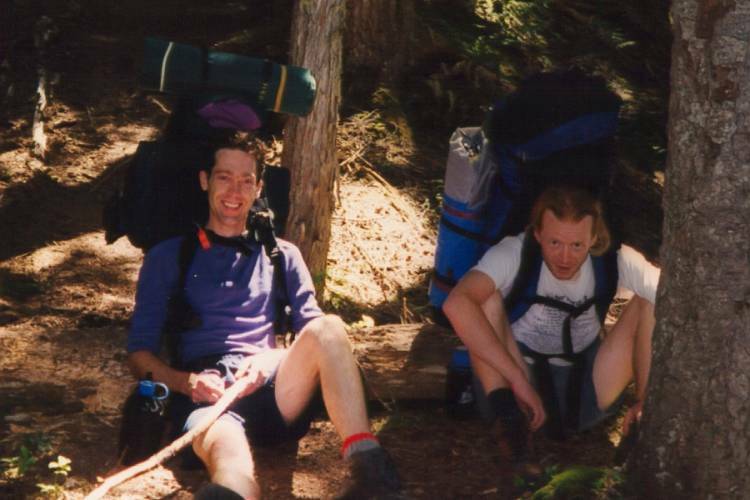 After I moved up to Seattle at the start of 1999, I took up Telemark skiing. I chose to Telemark, because it is graceful (when done properly) and very versatile; after climbing mountains, I find the descents tedious, and I love getting into the backcountry to ski. Telemark skiing is quite hard on the knees, but I made sure I always used releasable bindings, and had them set quite loose. I spent a couple of seasons learning to ski sufficiently well to be able to take trips into the backcountry, and learning more about avalanche avoidance and survival. At the start of February 2004, just as I was getting good enough to have some fun in the backcountry, I crashed and tore my ACL again. This was an especially annoying time to injure myself, as I was finally getting ready to take my karate Ni-Dan examination. The diagnosis was again not easy. The first opinion I had was from a surgeon who didn't think there was anything wrong at all. This was quite obviously wrong to me, because I had felt something give way during the crash, and I was having pain in the knee in karate training. There was initially a period of instability, but this settled down after a while. I had a second opinion from the surgeon who had operated on a SLAP lesion in my shoulder. The Lachman test was marginal, but it had not been very conclusive the first time I tore the ACL. A Pivot shift test was positively indicative for a torn ACL. Due to other factors, I could not have an operation to repair the ACL again until June. I had a revision reconstruction on 18th June 2004, using an Achilles tendon allograft again. The tunnels drilled for the first repair were re-used, and a large graft was inserted using absorbable screws. The staple and screw from the first operation were removed (the staple was so firmly embedded that the surgeon broke one of his tools getting it out!). At the time of writing, it is only a day since the revision operation. There are some indications that this time rehabilitation may be easier. The swelling in the joint is less than the first time, and I actually have control and activation over my quadriceps. I also have an water cooling sleeve for the joint, and an insulated reservoir which I cam use to keep the joint cool without continually getting up to go to the freezer for ice-packs. Since this is a revision operation, the rehabilitation protocol will be quite cautious. I will be posting reports on progress occasionally. The first few weeks were very much easier than last time. I had very little pain, and was able to give up the painkillers within a week. I kept the quadriceps activation going throughout. I have some pitting edema (swelling) in the leg, but my physiotherapist showed me a massage exercise to help reduce it. We started into quad strengthening exercises almost immediately, using Respond (electro-galvanic stimulation). My recovery continues to go well. I have discarded the crutches outside of the house, and now do not need the brace inside the house either. The physiotherapist has been giving me more quadriceps, and lately hamstring strengthening and balance exercises to do. I managed to rotate all the way with the stationary bike in the fourth week, and am now gently spinning for several minutes every day. I am not driving yet (I have a manual car, and also don't have the strength or mobility to respond in case of an emergency), so I have been relying on the goodwill of friends to drive me around. I took part in an archery tournament at the end of the fourth week, and was pleased with the result, coming fourth.